It’s Better Hearing and Speech Month! In 1927, the American Speech-Language Hearing Association founded better hearing and speech month to raise awareness about hearing and speech disorders to help people identify if they or someone they love need help and treatment. We want to prevent and reverse hearing loss through research and be an educational resource about all things hearing related. 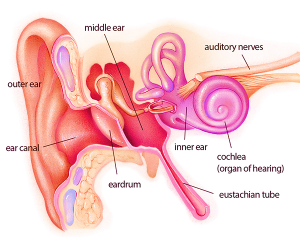 Outer Ear is made up of: the part we see on the sides of our heads, known as pinna; the ear canal; and the eardrum, sometimes called the tympanic membrane, which separates the outer and middle ear. Middle Ear is made up of: the eardrum and three small bones called ossicles that send the movement of the eardrum to the inner ear. Inner Ear is made up of: the snail shaped organ for hearing known as the cochlea, the semicircular canals that help with balance, and the nerves that go to the brain. Medical professionals have created three different classifications for hearing loss: conductive hearing loss, sensorineural hearing loss and mixed hearing loss. Conductive hearing loss refers to damaged structures of the middle ear, typically reversible through surgery. Sensorineural hearing loss, on the other hand, often means irreversible damage to the inner ear, specifically the death of hair cells within the cochlea or injury to the auditory nerve. 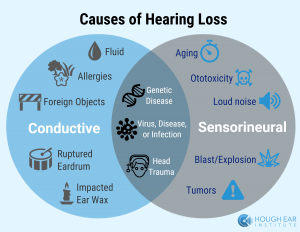 Hazardous and prolonged exposure to loud noise is one of the largest causes of sensorineural hearing loss; genetics, viruses, disease, bacteria, head trauma, drug or antibiotic side effects (ototoxicity), and aging are also major contributors. Mixed hearing loss, as the name suggests, means a patient struggles from a combination of conductive and sensorineural hearing loss. Whether people need hearing aids, surgery, or routine ear cleaning, restored hearing drastically improves people’s quality of life, restoring: relationships, physical health, confidence, mental health, and social life. At Hough Ear Institute we are on a mission to prevent and reverse permanent hearing loss and currently researching effective drug delivery systems for inner ear hear cell regeneration. Click here to learn more about the American Speech-Language-Hearing Association.